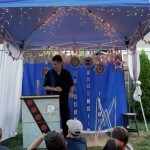 During the year I occasionally instruct magic workshops through local parks and recreation departments. One of my students, Ben, had so much fun that he wanted to have me perform for his birthday party. 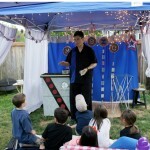 His mom, Ginny, created a “stage” out of a tent that looked very magical. A birthday party they’ll always remember! Check out the “stage” that Ginny, the birthday boy’s mom, created for me! “I will tell you, Liam had the best time of his life. We thought he was going to spontaneously combust! Everyone has been talking about the show and how amazing it was. You just did such an amazing job in every way and everyone thought so. Seriously, the adults have not stopped talking about it either. I will be singing your praises for years to come! You MADE my sons birthday, and probably his year! I will make sure any of the quality photos head your way, and of course refer you to everyone! I think there were some grandparents there who will most definitely do the same as well. You exceeded all of our expectations. Thanks again so so much for putting such a big smile on Liam’s face! 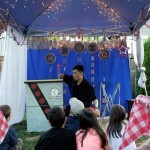 Learn more about my magic shows for kid’s birthday parties at www.mymagicparty.com. For prices, availability, and party options call Jeff Evans in Olympia at (360) 412-5064 or toll-free (877) 412-5064 or send e-mail to jeff [at] amazementproductions.com. 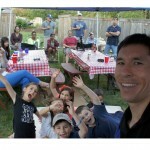 This entry was posted in Uncategorized and tagged birthday magician, birthday party, Lacey, magic show, magician, Olympia, Tumwater. Bookmark the permalink.